It’s week three of my internship experience at the Irish Heritage Park and everything demonstrated by Richard and Denis in the first two weeks is starting to come together. On Monday I went back in to Cutting 2 and set out a new sondage which I, Zac and Phillip (students on the program) then began to excavate using a mattock. Our sondage was to follow an orange/rust coloured soil and see how far along the site it went. It appears to exist along the whole length of the cutting and is a topic of much debate between Denis and Richard, as to whether it is ‘in-situ’ natural soil, or a redeposit from digging the adjacent site ditch. Tuesday morning was spent back in Cutting 2. Another Sondage was marked off and me and Zac continued excavating our sondage from Monday. At noon the students and staff headed down the hill from the dig site to the Irish National Heritage Park audio visual room, as Aidan O’ Sullivan and Brendan O’ Neill had come down from University College Dublin to give a talk on their MSc in Experimental Archaeology and Material Culture. Aidan gave a lecture on the program and gave examples of past projects students have completed. Experimental archaeology is the study of reconstructions of past buildings, material culture and technologies in the hope of better understanding their role materialistically and culturally in the past. Many of the students were very interested and took pamphlets on the program. I myself am applying, in hopes to start the program in September. Wednesday was a great day. I dug in Cutting 2 - still chasing back the rust coloured soil in my sondage until 11am! After which the group received a treat. 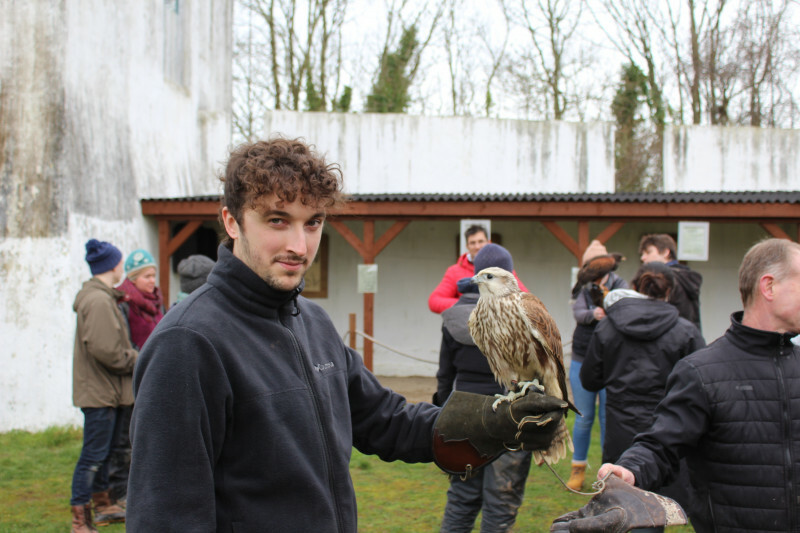 Jim, the parks falconer, took me and all the students and staff over to the park’s falconry centre. We were all introduced to the park’s birds of prey collection and even allowed to hold and take pictures with some of the birds. This was a great way to break the week up with something a little bit different and was very kind of Jim to do this for us. So thank you Jim! Thursday was spent removing large amounts of soil from Cutting 2. 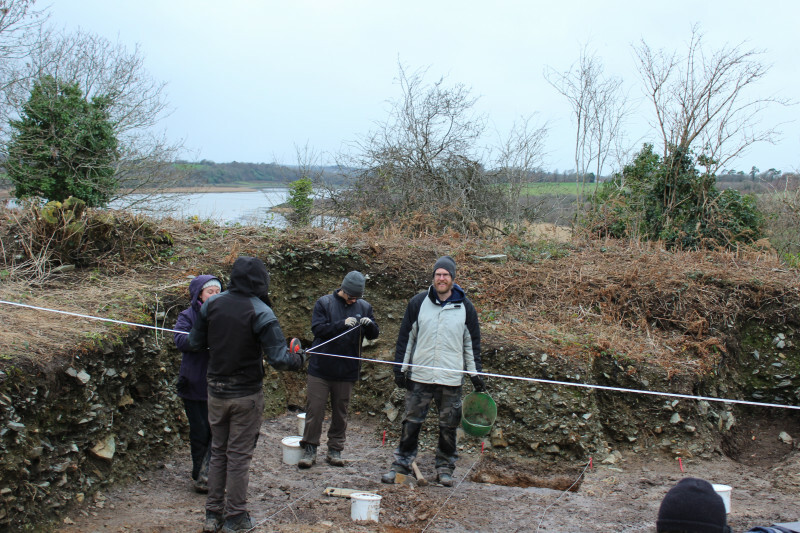 Many of the students from the cutting were concentrating on cataloguing, drawing and photographing post holes. They would also excavate the post holes and bring the contents inside to post excavations to be floated to get charcoal samples which would then be sent away to experts for carbon dating. The students and I also received a geology lecture from Steve (one of the program directors) explaining the types of stone found on site and how it came to be there. Very useful when trying to identify what is happening with the landscape of the site. Friday was spent in post excavation. 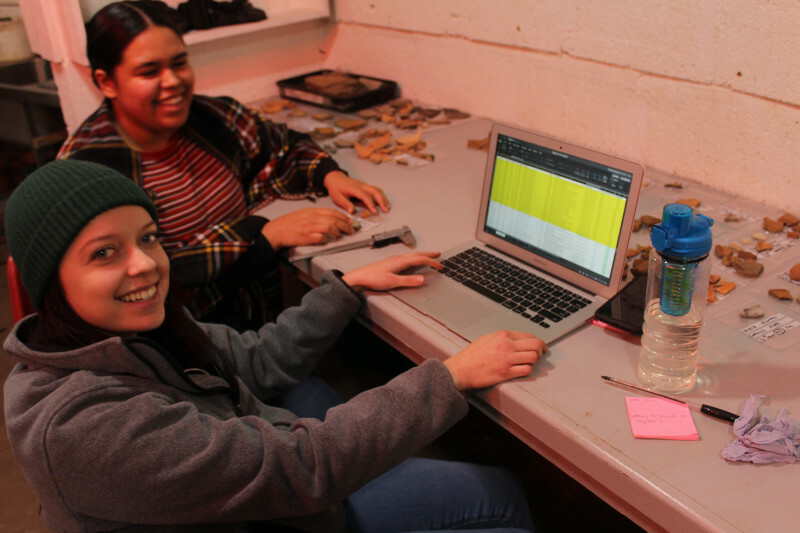 I, Melissa and Zac (students of the program) where all very lucky to have Aisling (a past intern and current teaching assistant) walk us through how finds and samples are registered, bagged and cleaned. Aisling is rather an expert in these matters, and it was great to learn from her. It was also great to learn another aspect of archaeology!